I was recently asked to comment on Stefan Rahmsorf’s post What ocean heating reveals about global warming at RealClimate. There is a link to a pdf edition of this post at the end. As I’ve noted in previous posts, I am not criticizing the efforts by the National Oceanographic Data Center (NODC) to assemble data for its ocean heat content data. It was (and is) a monumental (ongoing) task but there’s simply little source data before the ARGO era. Ocean heat content data is chock full of problems and uncertainties as a result. If the topic of ocean heat content data is new to you, please refer to the very detailed discussions in the post Is Ocean Heat Content Data All It’s Stacked Up to Be? (The WattsUpWithThat cross post is here.) It and other posts are linked throughout this discussion. Also see the heading of Further Reading at the end of the post for additional information. Stefan occasionally changed topics from ocean heat content to surface temperatures and back again, which is not unusual (I often do it), so when there is a change in the metric being discussed I’ve advised readers. With that said, let’s examine Stefan’s post about ocean heat content. If the oceans are warming up, this implies that the Earth must absorb more solar energy than it emits longwave radiation into space. This is the only possible heat source. It must be kept in mind that the oceans have their own greenhouse-like effect. (See John L. Daly’s The Deep Blue Sea.) The oceans absorb sunlight (downward shortwave radiation) to depths of about 100 meters, with most of the sunlight being absorbed in the top 10 meters, but the oceans can only release heat at the surface—AND—they release that heat primarily through evaporation. (About 90% of the heat released from the oceans is through evaporation. See the discussion of Figure 3.6 from Chapter 3 of the IPCC’s AR5.) There are also numerous interactions between the atmosphere and ocean that can cause the oceans to warm to depth. 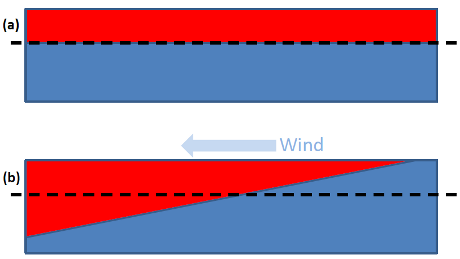 Examples: changes in wind patterns (as Stefan later mentions and as discussed later in this post) and periodic decreases in cloud cover (related to naturally occurring coupled ocean-atmosphere processes, like those associated with La Niñas) also cause the oceans to warm to depth. Bottom line: if the oceans are warming (not simply the surface, but to depth), this implies only that the oceans are absorbing more energy (primarily solar energy) than they are releasing (primarily through evaporation). It implies nothing more. Because we understand the energy balance of our Earth, we also know that global warming is caused by greenhouse gases – which have caused the largest imbalance in the radiative energy budget over the last century. 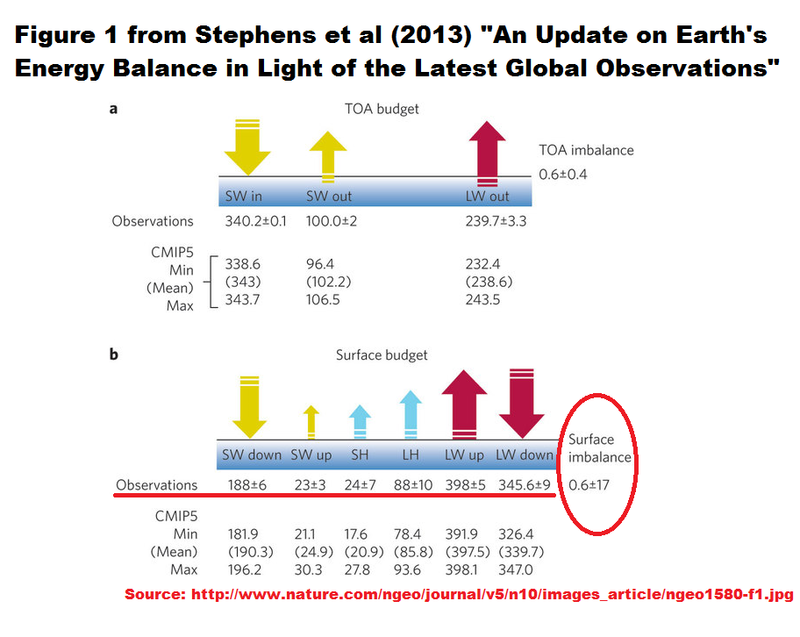 As we’ve presented and discussed in a couple of posts, an estimate of the radiative imbalance at the surface was recently presented in Stephens et al (2013) An update on Earth’s energy balance in light of the latest global observations. See their Figure 1, which I’ve annotated in my Figure 1. Stephens et al (2013) illustrate an imbalance at the surface of 0.6 watts/meter^2 with an estimated uncertainty of +/- 17 watts/meter^2. In other words, the imbalance may or may not exist. Note: Radiative imbalance is the metric that alarmists like to portray in terms of atomic bombs. What the alarmists fail to tell their readers is that sunlight and natural levels of infrared radiation at the surface are almost 890 times the number of atomic bombs they’re claiming, and that the uncertainties in radiative imbalance are 28 times the radiative imbalance. In an effort to make ocean heat content data sound more credible, Stefan notes the number of temperature profiles in the NODC’s World Ocean Database, which is the source data for ocean heat content. The data in the graphs comes from the World Ocean Database. Wikipedia has a fine overview of this database. The data set includes nine million measured temperature profiles from all of the world’s oceans. 1. 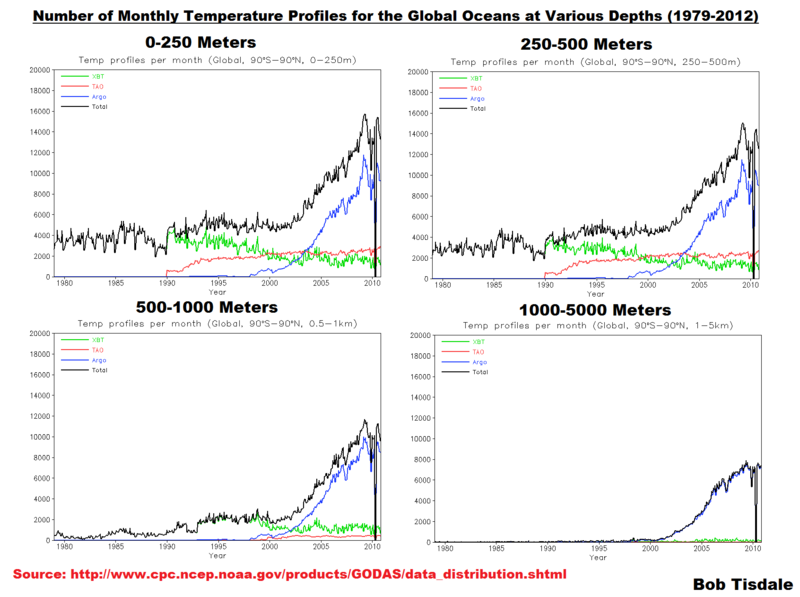 NOAA furnishes graphs of the number of monthly temperature profiles for the global oceans, at various depths, through their “Data Distribution” webpage here. The graphs run from 1979 to 2012. See Figure 2 for the number of profiles at 0-250 meters, 250-500 meters, 500-1000 meters and 1000-5000 meters. Let’s focus on the period before the early-to-mid 2000s, which is the period before the ARGO floats were deployed in quantity. The majority of the samples are at depths of 0-250 and 250-500 meters. There are fewer profiles at depths of 500-1000 meters. And there are comparatively few to no samples at depths of 1000-5000 meters before ARGO. 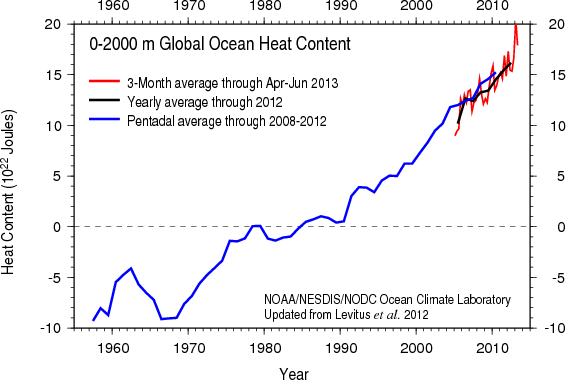 Ocean heat content source data is confined to the top 1000 meters before ARGO era. Thus, the NODC’s ocean heat content dataset for depths of 0-2000 meters is basically made up of temperature readings from 0-1000 meters, with few readings below 1000 meters. 2. 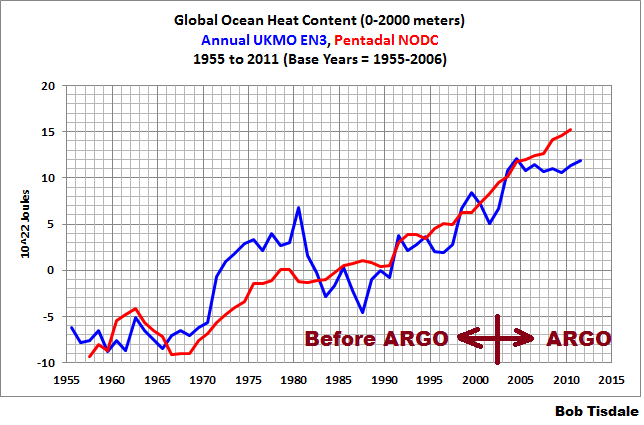 Even the IPCC acknowledges how poorly the ocean temperatures were sampled at depth before ARGO. See their Figure 3.A.2, (my Figure 3). 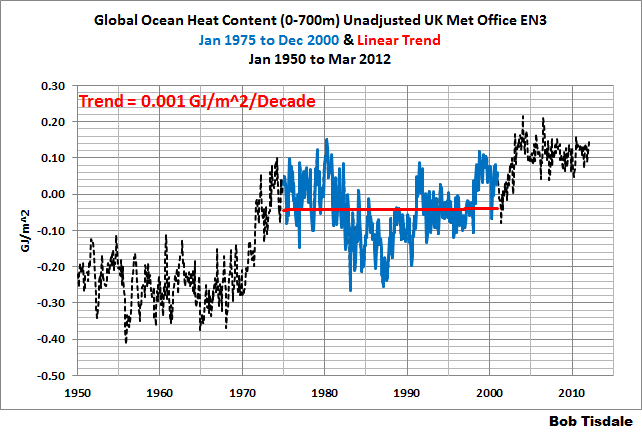 Note that in Figure 3.A.2, the IPCC is not illustrating temperature or ocean heat content. They are illustrating the percentage of the oceans covered by the temperature profiles. In the Southern Hemisphere (bottom cell), less than 20% of the oceans were sampled at all depths before ARGO era, and at depths greater than 700 meters, the temperature measurements covered only 0 to 5% of the Southern Hemisphere oceans before the early-to-mid 2000s. While in the Northern Hemisphere, the sampling was much better at depths of 0-700 meters. In other words, the NODC’s ocean heat content data for depths of 0-700 meters is primarily a Northern Hemisphere dataset before the early-to-mid 2000s. Or to phrase it another way, there was basically no coverage of the oceans in the Southern Hemisphere before ARGO. 3. Through their webpage here, the NODC publishes maps of the locations of temperature samples, at various depths, for each quarter since January to March 1955. I’ve downloaded them for three depths and created animations so that readers can see how few temperature samples are available for ocean heat content data. The animations are for the depths of 250, 500 and 1500 meters. Each black dot on a map represents one (1) temperature measurement at that depth for a 3-month period. There is also a scale on the maps that explains the number of readings associated with the green, orange, and red dots. Readings at 250 meters and 500 meters, and other depths, are used in the NODC’s data for the depths of 0-700 meters. As you’ll note, global coverage improves with time until the 1990s, but then it worsens until the ARGO floats are released in the early 2000s. You’ll also note that the sampling is better at the 250 meter level than at 500 meters. It’s much, much worse at 1500 meters, which is used for the data for the depths of 0-2000 meters. The animation files are large, so they may take a few moments to download. 4. Figure 4 is a graph I prepared for the post UKMO EN3 Ocean Heat Content Anomaly Data Disappeared From The KNMI Climate Explorer As Suddenly As It Appeared. It compares the much-adjusted NODC ocean heat content data for depths of 0-700 meters to the unadjusted UKMO EN3 ocean heat content data. The UKMO EN3 data were only available through the KNMI Climate Explorer for a short time before it was removed. (The NODC ocean heat content data for 0-700 meters are still available through the KNMI Climate Explorer.) The inconvenient rise in the unadjusted ocean heat content in the 1970s could not be explained by climate models (Source of that model-data comparison is here. See page 8. ), so the climate science community went in search of reasons (excuses) to delete the unexplainable (by climate models) warming. Note also that the unadjusted ocean heat content during the ARGO era was inconveniently flat and that it too must be adjusted to show warming. Figure 5 is from the post More on Trenberth’s Missing Heat. It’s similar to the above graph, but in Figure 5 the data are for the depths of 0-2000 meters. 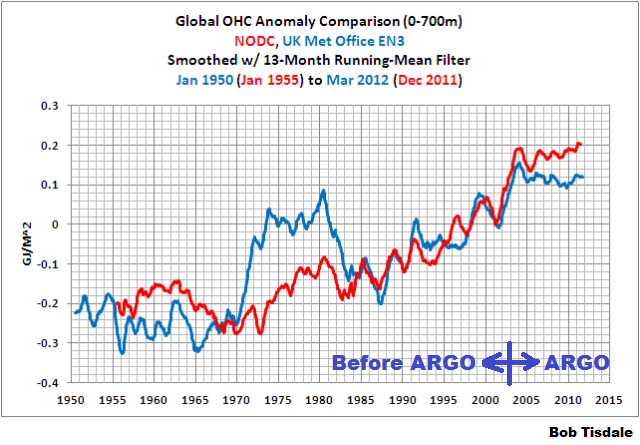 The unadjusted UKMO EN3 data to 2000 meters also shows the inconvenient warming during the 1970s, and it also shows the inopportune flattening of the unadjusted data during the ARGO era for the depths of 0-2000 meters. The 1970s rise in the unadjusted ocean heat content data was inconvenient for the climate science community because it showed that the oceans could warm without being forced to do so by manmade greenhouse gases, or to phrase it another way, it showed that ocean warming to depth was not dependent on anthropogenic forcings. There was another problem the unadjusted data created for global-warming-enthusiast scientists and it was, the global ocean heat was at the same levels in the 1970s as it was in the mid-1990s and as it was in about 2000. See Figures 6 and 7. In other words, ocean heat could remain relatively flat for decades globally, which indicated that increased emissions of manmade greenhouse gases had little impact on ocean warming. Notice how highlighting the mid-term flat periods of ocean heat in Figures 6 and 7 also help to bring out the periods of no warming that occurred from the 1950s to about 1970 and later during the ARGO era. And there were explanations for the early 1970s warming, changes in wind patterns, but more on that later. 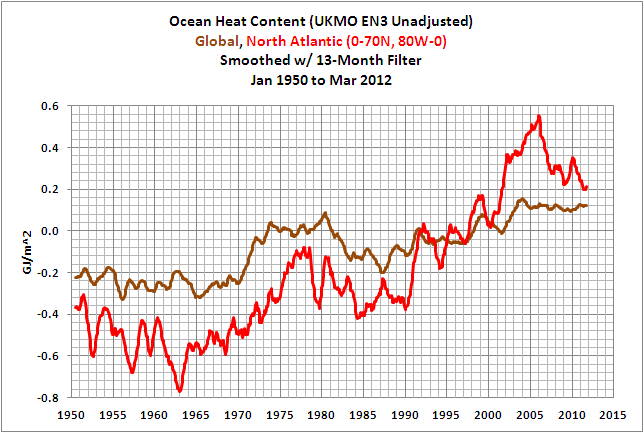 So let’s take a look at the North Atlantic ocean heat content data. Based on the linear trend, the ocean heat content data of the North Atlantic for the depths of 0-2000 meters haven’t warmed from 2005 to 2012. See Figure . And the data for depths of 0-700 meters show cooling in the North Atlantic. The additional warming at the depths of 700-2000 meters (illustrated by the “difference”) was comparable to the cooling at 0-700 meters, inferring there might simply have been an exchange of heat between two depth ranges, but there is no evidence of manmade greenhouse gas-driven warming in the North Atlantic from 2005-2012. 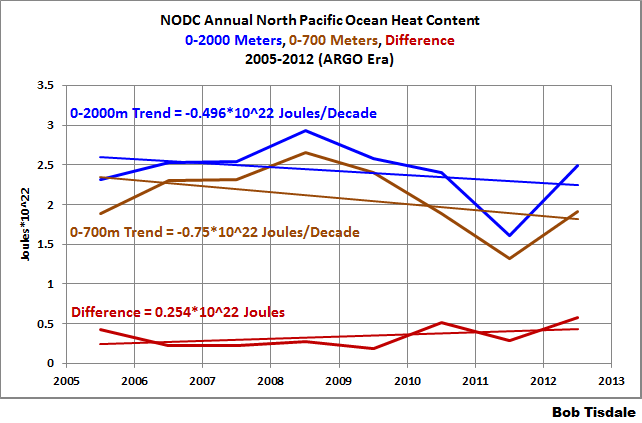 But the NODC’s annual ocean heat content data for the North Pacific shows cooling, Figure , not warming, for the depths of 0-2000 meters. And the depths of 0-700 meters have cooled at an even more drastic rate. If the stronger trade winds associated with the La Niña events have contributed to the warming of the North Pacific ocean heat content from 700-2000 meters (shown as the “difference”), then the only thing those stronger trade winds did was prevent the 0-2000 meter data from cooling as quickly as the 0-700 meter data. 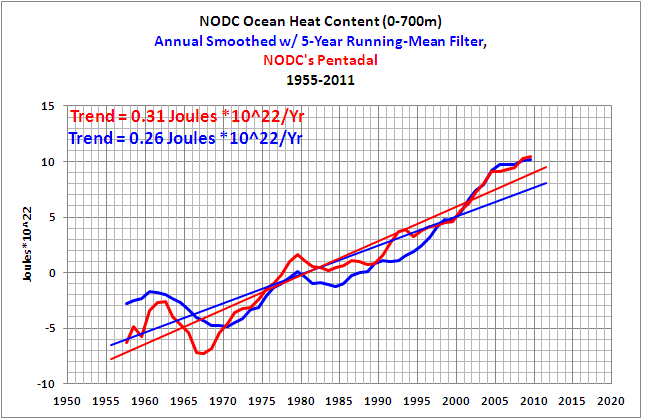 Bottom line: The much-adjusted NODC ocean heat content data for the North Atlantic and North Pacific do not show, as Stefan wrote, “[t]he heat content of the oceans is growing and growing.” Or in other words, ““[t]he heat content of the oceans is growing and growing”, but only in the Southern Hemisphere oceans. That’s inconvenient for the hypothesis of human-induced global warming, because carbon dioxide is said to be a well-mixed greenhouse gas. If the Northern Hemisphere oceans are not being warmed by manmade greenhouse gases, then there is no reason to assume the warming in the Southern Hemisphere is being caused by manmade greenhouse gases. I’ll let you comment on “Ideologically motivated ‘climate skeptics’”. The first post Stefan linked (dismissed as “negligible”) was written in German. The Google translation to English is here. I believe Stefan ignored one of the primary points illustrated in the post at JoNova’s that he linked here. The change in temperature of the oceans to depth IS “negligible”. I’ve also illustrated this in recent posts. 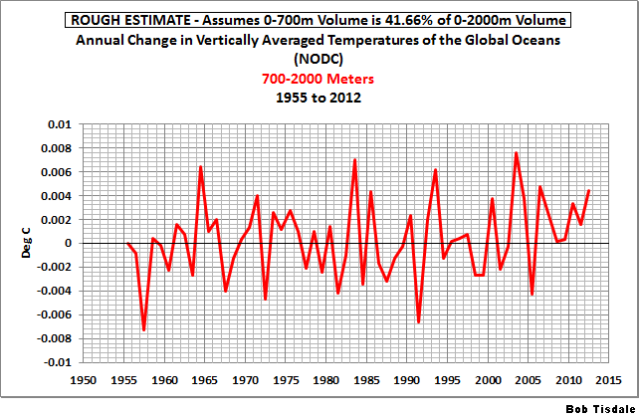 See my post Rough Estimate of the Annual Changes in Ocean Temperatures from 700 to 2000 Meters Based on NODC Data. As shown in Figure 10, for the depths of 0-700 meters, the annual variations are measured in hundredths of a degree C., and when compared to the annual variations in sea surface temperatures, for example, the variations in the temperature of the global oceans to depths of 0-700 meters are “negligible”. And for the depths of 700-2000 meters, the annual variations are measured in thousandths of a degree C. Those variations are so minute, so minuscule, we have to isolate them from the other data to see the changes. See Figure 11. We’ve also compared on a time-series basis, Figure 12, the long-term warming of global land plus sea surface temperature anomalies, sea surface temperature anomalies, vertically averaged temperature for the depths of 0-700 meters, and vertically averaged temperature for the depths of 700-2000 meters. Compared to the sea surface temperature and global land plus sea surface temperatures, the long-term warmings at 0-700 meters and 700-2000 meters are “negligible”. In past posts (here and here), we showed that the NODC increases the warming rate of their ocean heat content data by presenting their data in pentadal form. See the comparison graphs at depths of 0-700 meters (here) and 0-2000 meters (here). 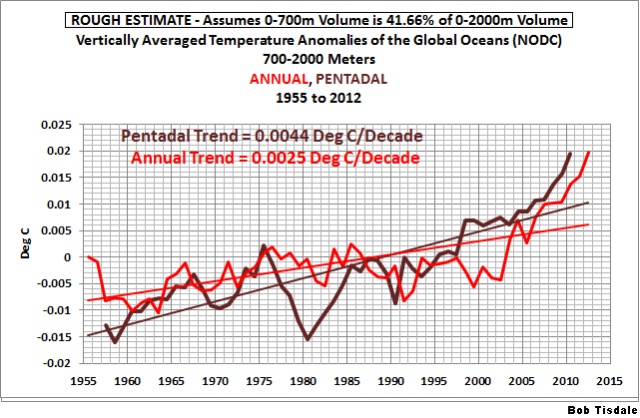 But let’s forget for a moment that the NODC’s pentadal data mysteriously exaggerates the warming rate. 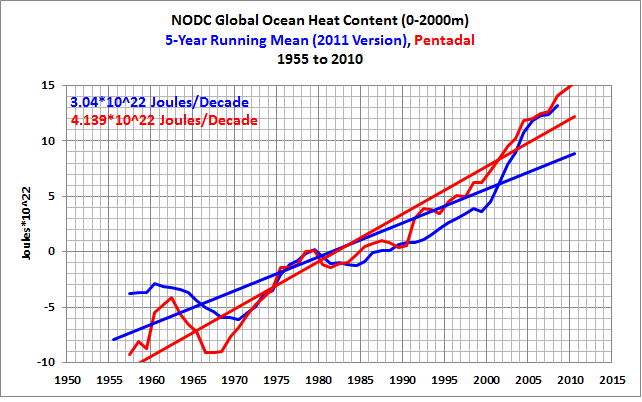 Since 1955, the NODC’s pentadal vertically average temperature data show the oceans warmed at a rate of 0.0044 deg C/decade for the depths of 700-2000 meters. See Figure 13. That’s 44 ten-thousandths of a deg C/decade. 44 ten-thousandths of a deg C/decade is of the “who cares?” order of magnitude. It’s not coming back to haunt anyone at any time. 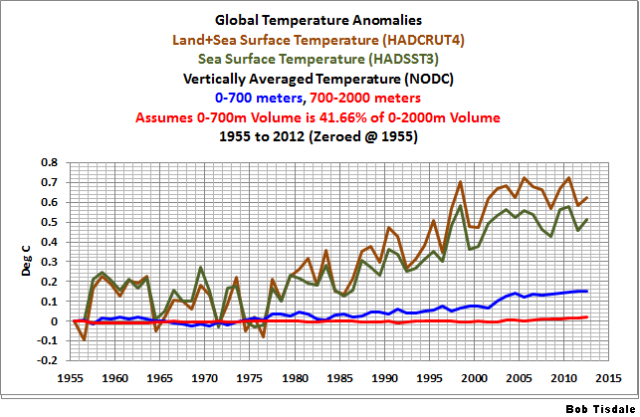 Figure  presents the vertically averaged temperature anomalies for the global oceans for the depths of 700-2000 meters. They warm at a relatively constant and very slow rate until the ARGO floats begin the have complete coverage of the global oceans around 2003. 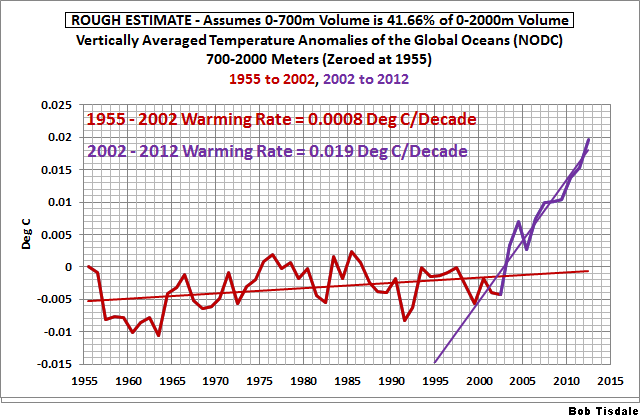 Then they warm at a rate that’s almost 24 times faster than the rate seen in the 5 decades leading up to it. Completely independently of this oceanographic data, a simple correlation analysis (Foster and Rahmstorf ERL 2011) showed that the flatter warming trend of the last 10 years was mostly a result of natural variability, namely the recently more frequent appearance of cold La Niña events in the tropical Pacific and a small contribution from decreasing solar activity. We discussed in great detail the flaws in the Foster and Rahmstorf’s “simple correlation analysis” in Revised Post – On Foster and Rahmstorf (2011), and we discussed their follow-up paper in the post Rahmstorf et al (2012) Insist on Prolonging a Myth about El Niño and La Niña. Please refer to those posts for discussions of the long-term impacts of El Niño and La Niña events. Even the global warming enthusiasts from SkepticalScience are distancing themselves from Foster and Rahmstorf. 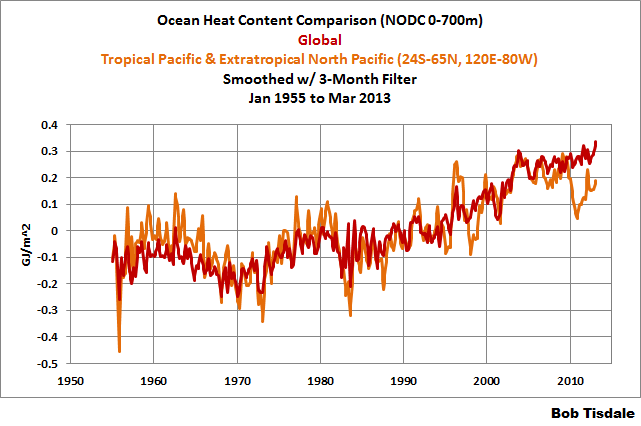 The NODC’s ocean heat content data for the tropical Pacific (24S-24S, 120E-80W), for the depths of 0-700 meters, since 1955, is presented in the left-hand graph of Figure 15. The warming of ocean heat content for the tropical Pacific is dependent on La Niña events, which are fueled by La Niña-caused increases in sunlight. Note that the ocean heat content cools there over the multidecadal periods between the 1954-57 and 1973-76 La Niñas and between the 1973-76 and 1995/96 La Niñas. It’s tough to claim manmade greenhouse gases are causing warming when the ocean heat is cooling for multidecadal periods in the tropical Pacific. The strong El Niño events of 1972/73, 1982/83, 1997/98 and 2009/10 make their presence known as the sharp drops in tropical Pacific ocean heat content, because El Niño events can release tremendous amounts of heat into the atmosphere, primarily through evaporation. Ocean currents also carry warm water away from the tropical Pacific at the end of an El Niño. The ocean heat content data for the tropical Pacific helps to confirm that the processes of La Niña and El Niño events combine to act as a chaotic, naturally occurring, sunlight-fueled, recharge (La Niña)-discharge (El Niño) oscillator. Let’s move on to the adjoining area of the North Pacific. In the right-hand graph of Figure 15 is the NODC ocean heat content data for the extratropical North Pacific (24N-65N, 120E-80W), 0-700 meters, also starting in 1955. From 1955 to 1988, the ocean heat content of the extratropical North Pacific cooled. In other words, there was no warming associated with manmade greenhouse gases from 1955 to 1988. And it’s also blatantly obvious that the warming there depends on the shift that occurred in 1988/89, which corresponds to a shift in wind patterns (and sea level pressure) in the extratropical North Pacific. NOTE: If the subject of the natural warming of the global oceans is new to you, refer to the illustrated essay “The Manmade Global Warming Challenge” (42MB) for an introductory discussion. When we combine the two Pacific subsets (which show no evidence of human-induced global warming) and compare them to global ocean heat content (which is presented by alarmists as proof of human-induced global warming), we find that the long-term warming of the global data mimics the combination of the two Pacific subsets. See Figure . 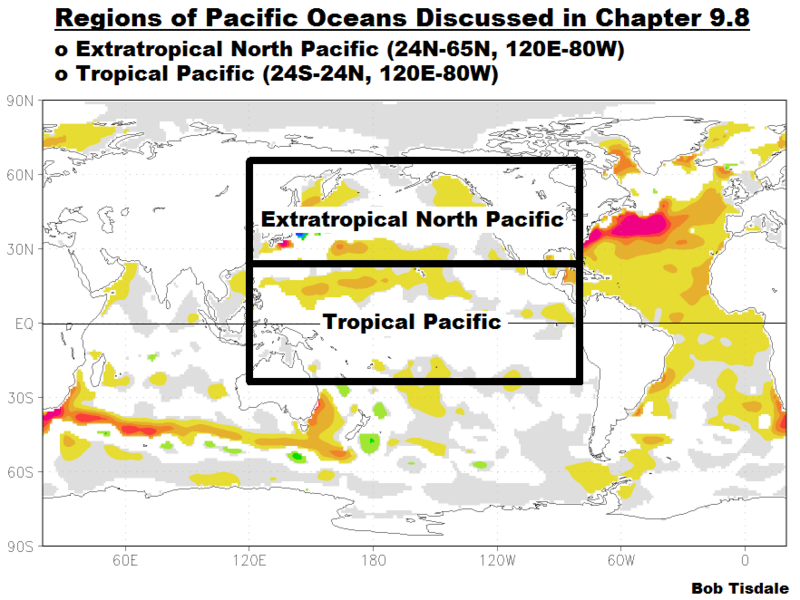 The tropical Pacific and the extratropical Pacific combined cover about 34% of the global oceans. More than one-third of the oceans to depths of 700 meters show no evidence of human-induced global warming since 1955, yet we’re being told that manmade greenhouse gases are responsible for the warming of global ocean heat content. Don’t worry. I haven’t forgotten all of the additional long-term warming shown in the ocean heat content data for the North Atlantic. We’ll discuss it later in the post. · Even More about Trenberth’s Missing Heat – An Eye Opening Comment by Roger Pielke Sr.
…the warm water created by La Niña processes, released by El Niños, and redistributed by the trailing La Niñas is warmed in response to increases in sunlight during the La Niñas, not by infrared radiation. Changes in cloud cover associated with the coupled ocean-atmosphere processes of El Niño and La Niña are the primary reasons for the variations in sunlight. In the linked “Open Letter” post, I presented data, scientific studies, and a quote from an earlier paper by Kevin Trenberth to confirm that La Niña-created increases in sunlight are what fuels El Niño events…and any increases in subtropical ocean heat content that may arise during periods of La Niña dominance. Stefan overlooked what’s indicated by the satellite-enhanced sea surface temperature data (Reynolds OI.v2). I’ve been illustrating this for years. In the left-hand graph of Figure 17, we can see that the sea surface temperatures of the East Pacific have warmed little, if at all, over nearly the past 32 years…since the start of the Reynolds OI.v2 sea surface temperature dataset in November 1981. The East Pacific (90S-90N, 180-80W) covers about 33% of the surface of the global oceans. In the right-hand graph are the sea surface temperature anomalies of the South Atlantic, Indian and West Pacific oceans. The coordinates are listed in the title block. They cover more than 50% of the surface of the global oceans. We can see a number of things in the sea surface temperature data for the South Atlantic, Indian and West Pacific oceans: (1) their long-term warming depends on the El Niño events of 1986/87/88 and 1997/98 (and possibly the El Niño of 2009/10); (2) they do not cool proportionally during the transition to the trailing La Niñas of 1988/89 and 1998-01; but (3) they do cool slightly over the decade-long periods between the El Niño events of 1986/87/88 and 1997/98 and between the 1997/98 and 2009/10 El Niños. 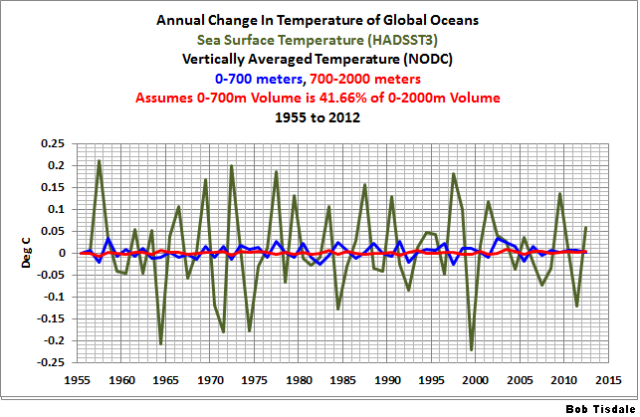 Again, for an introductory discussion of the natural warming of the global oceans refer to the illustrated essay “The Manmade Global Warming Challenge” (42MB). The sea surface temperatures of the North Atlantic are governed by another mode of natural variability called the Atlantic Multidecadal Oscillation or AMO. It’s the reason why the sea surface temperatures there warmed at a much higher rate than the rest of the global oceans from the mid-1970s to the early-2000s. 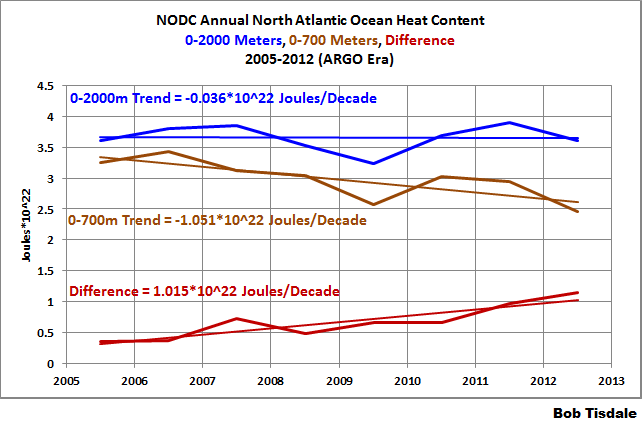 But the sea surface temperature data for the North Atlantic indicate the AMO may have already peaked. See Figure 18. 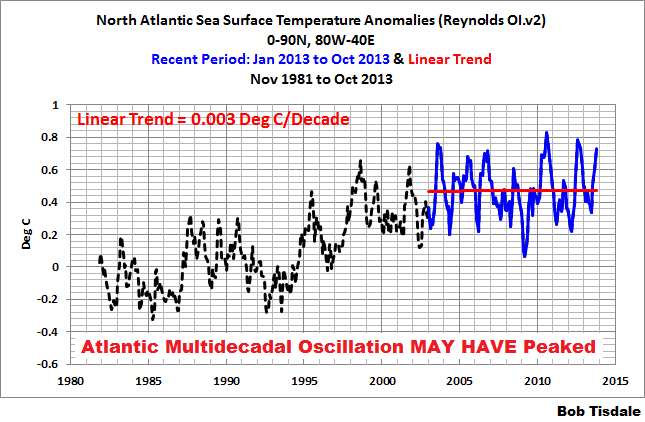 If history repeats itself, and there is no reason to believe it will not, then the sea surface temperatures of the North Atlantic will show no warming and actually cool for a few more decades, assuming the Atlantic Multidecadal Oscillation has, in fact, peaked. The sea surface temperature data indicate that global warming will continue when the next strong El Niño releases sunlight-created warm water from beneath the surface of the West Pacific Warm Pool and ocean currents distribute that warm water into the South Atlantic, Indian and West Pacific oceans at the end of that El Niño. But much will also depend on how the North Atlantic responds to that strong El Niño. If the sea surface temperatures of the North Atlantic are cooling, while those of the South Atlantic, Indian and West Pacific oceans are warming, global sea surface temperatures could remain relatively flat in response to the next strong El Niño. We’re back discussing ocean heat content data again. “We suggest that the large-scale, decadal changes…associated with the NAO [North Atlantic Oscillation] are primarily responsible for the ocean heat content changes in the North Atlantic over the past 50 years,” the authors concluded. By contrast, NOA[sic]-driven winds served to “pile up” sun-warmed waters in parts of the subtropical and tropical North Atlantic south of 45 degrees, Lozier said. That retained and distributed heat at the surface while pushing underlying cooler water further down. The illustration above provided by Stefan Rahmstorf helps to show this effect. 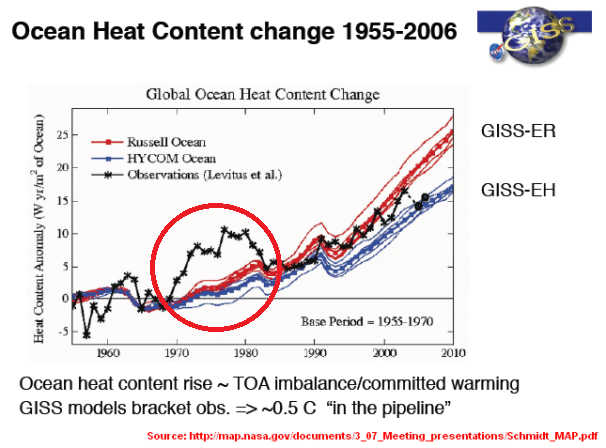 The best part of Lozier et al (2008) was that they used the older version of the ocean heat content data, the “unadjusted” data with the sharp rise in the 1970s. See Figure 19. Also keep in mind that Lozier et al were not saying that the North Atlantic Oscillation was responsible for the additional warming in the North Atlantic; they were saying it was responsible for ALL of the warming in the North Atlantic. 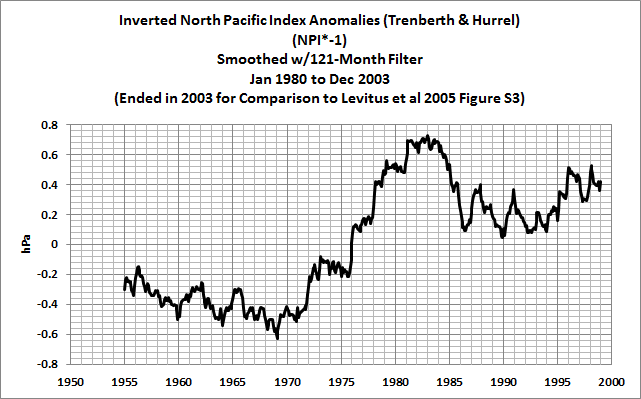 And as I pointed out in the post Is Ocean Heat Content Data All It’s Stacked up to Be?, the North Pacific Index, which is associated with wind patterns in the North Pacific, also has the sharp change in the early 1970s, like the ocean heat content there did originally, before the climate science community deleted the inconvenient 1970s warming. See Figure 20. In other words, there were very logical explanations for the sharp rise in global ocean heat content in the early 1970s, yet the climate science community chose to delete the inconvenient data. This was discussed in more detail under the heading of COULD THE 1970s-80s HUMP HAVE BEEN EXPLAINED? in the post Is Ocean Heat Content Data All It’s Stacked up to Be? 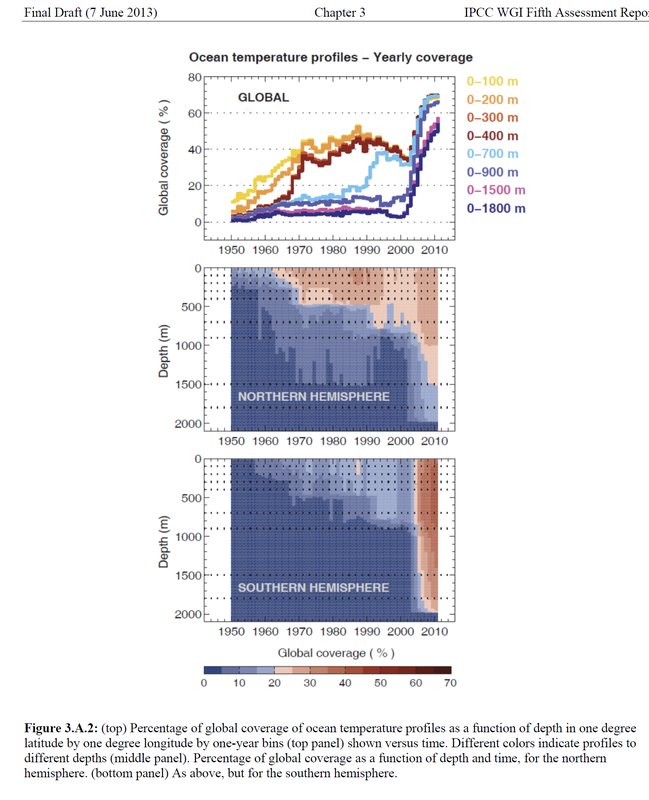 Bottom line: Regardless of whether or not the 1970s sharp rise in ocean heat content existed, Stefan Rahmstorf confirmed that changes in wind patterns can cause ocean heat content to warm. He also noted that “there are also other possible mechanisms”, but he elected not to discuss them. Figure 21 is a map that illustrates the warming and cooling rates of global ocean heat content, for depths of 0-700 meters, from 2005 to 2012. As you’ll recall, the NODC uses this as the ARGO era. Note the spatial patterns of warming and cooling, especially in the Pacific and Indian Oceans. I presented an animation of ARGO-era ocean heat content anomaly maps in the post Is Ocean Heat Content Data All It’s Stacked up to Be? I’ve updated it for this post in Animation 1. The animation starts in 2004 to provide a short lead-in before 2005. You can watch warm water that’s left over from the El Niños being passed from the tropical Pacific into the Indian Ocean during the trailing La Niñas by the current called the Indonesian Throughflow. That leftover warm water counteracts any cooling that would result during the trailing La Niñas due to changes in atmospheric circulation. Note also how the leftover warm water also migrates to the South Pacific Convergence Zone, which is east of Australia and New Zealand. If and when the climate science community can account for the sunlight-created warm waters distributed from the tropical Pacific by ENSO that create the warming and cooling trends shown in Figure 21, they may be able to realistically explain why the oceans warm to depth. Until that time, they are simply assuming, wrongly, that manmade greenhouse gases are the primary cause of the warming of the global oceans. 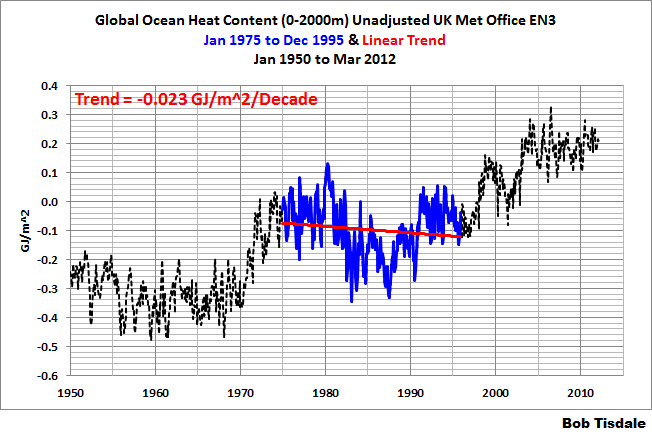 LOOKS LIKE SUNLIGHT AT THE OCEAN SURFACE HAS ALSO INCREASED SINCE 1979! We’ve been told numerous times that only infrared radiation from increased emissions of manmade greenhouse gases could be responsible for the warming of the global oceans. 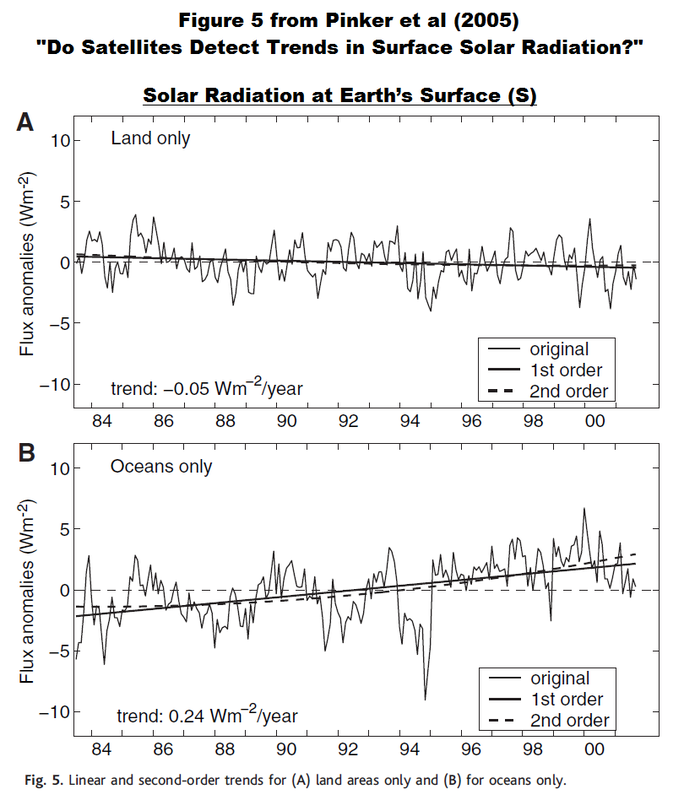 Figure 22 is Figure 5 from Pinker et al (2005) Do Satellites Detect Trends in Surface Solar Radiation? 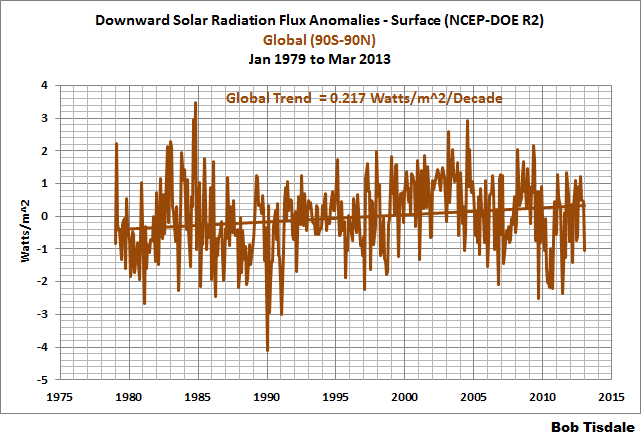 They showed solar radiation at the surface of the oceans increasing at a rate of 0.24 watts/m^2 from 1983 to 2001. I first presented Pinker et al (2005) in the post The Sun Was in My Eyes – Was It More Likely Over the Past 3-Plus Decades? 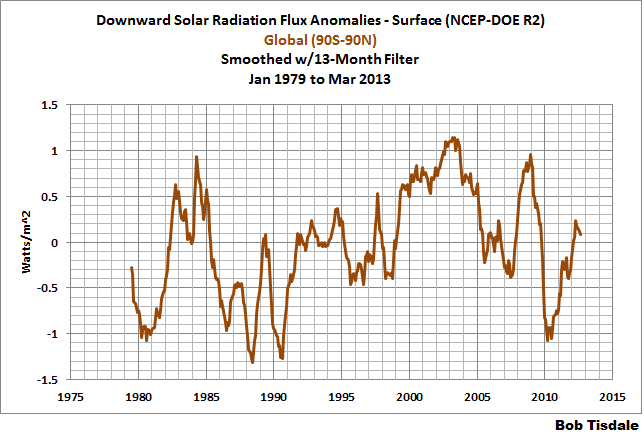 I also presented downward shortwave radiation from the NCEP-DOE Reanalysis-2 for the period of Jan 1979 to Mar 2013. See Figures 23 and 24. Now consider that solar radiation penetrates the oceans to about 100 meters, with most solar radiation being absorbed in the top 10 meters, while infrared radiation from manmade greenhouse can only penetrate the top few millimeters. 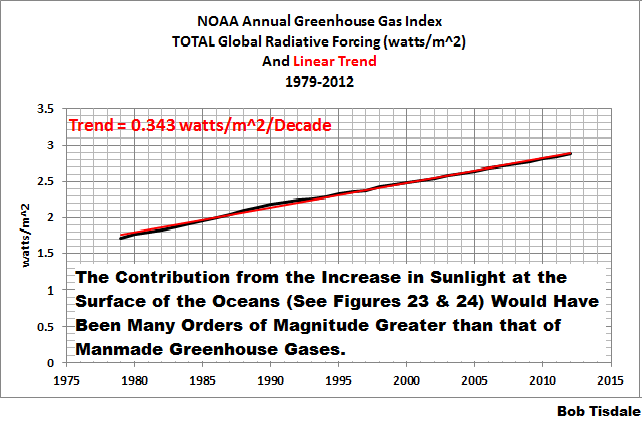 And according to the NOAA Annual Greenhouse Gas Index, infrared radiation from manmade greenhouse gases increased at a rate of 0.34 watts/meter^2 from 1979 to 2012 (Figure 25), so, based on the penetration of sunlight versus infrared radiation into the oceans, the contribution of the increase in sunlight at the surface of the oceans would be many orders of magnitude greater than that of infrared radiation from manmade greenhouse gases. It’s pretty obvious why Stefan Rahmstorf failed to include this topic in his post at RealClimate. In addition to Is Ocean Heat Content Data All It’s Stacked up to Be?, I’ve linked a number of past posts during this discussion. Just in case you’ve overlooked them (which is easy in a post this large) here are links to recent ocean heat content-related posts, with links to the cross posts at WattsUpWithThat in parentheses. Ocean heat content data and satellite-era sea surface temperature data indicate the oceans warmed via natural ocean processes, not from manmade greenhouse gases. This has been addressed in dozens of blog posts here and in cross posts at WattsUpWithThat for almost 5 years. I further discussed this in minute detail in my book Who Turned on the Heat? It is only available in .pdf form. A preview is here. Who Turned on the Heat? is described further in, and is available for sale through, my blog post “Everything You Ever Wanted to Know About El Niño and La Niña”. The natural warming of the global oceans was also discussed in Section 9 of my more recent ebook Climate Models Fail. See the preview and table of content here. There really wasn’t anything new in Stefan Rahmstorf’s post at RealClimate. It was full of the typical propaganda we’ve come to expect from global warming enthusiasts. In fact, we’ve addressed the subjects he’s covered in past posts, so this post was basically a rehashing, with lots of links to past posts that provide more detail. 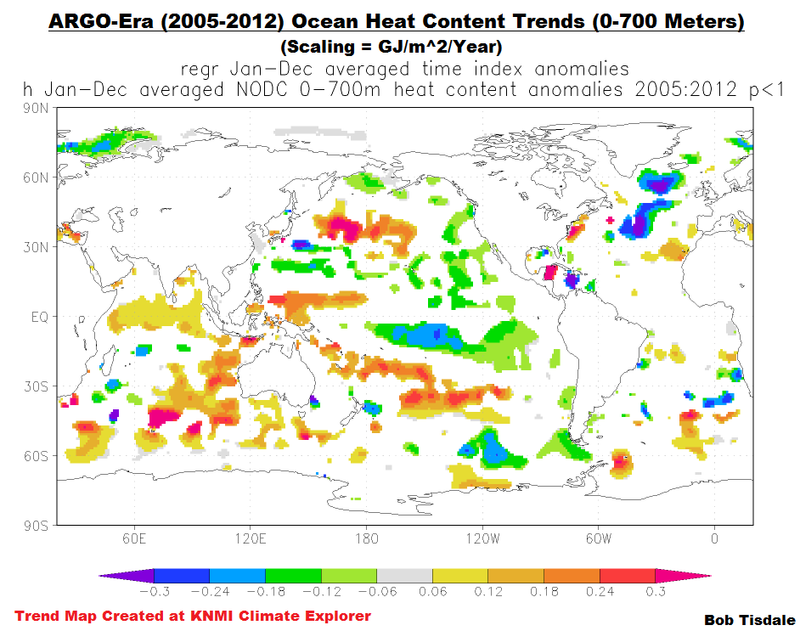 I’ll close this post with two quotes about ocean heat content data and my comments about them. Both quotes appeared in the post Is Ocean Heat Content Data All It’s Stacked up to Be? I’ve updated and clarified my comment from the “stacked up to be” post as follows: So, as of 2013, we’ve had in place a “new technology” for about a decade that “promises to give us the data we need to begin to understand this largest component of the global water cycle”. Now consider that there are known ocean climate processes that portray themselves in the sea SURFACE temperatures of the North Atlantic and North Pacific, and that we have reasonably complete sea SURFACE temperature records stretching back to the late 1800s. These ocean climate processes portray themselves as modes of natural variability with patterns in time that last for 50 to 80 years. Can we hope now, with only 10 years of reasonably complete subsurface temperature and salinity data, to understand the impacts of those multidecadal processes on ocean heat content? The realistic answer is no. ARGO floats have provided reasonably complete coverage of the global oceans since 2003-04, and the installation was complete in 2007. But as late as 2011, Kevin Trenberth’s opinion was that they provided limited value due to “missing and erroneous data and calibration”. The bottom line of those two quotes: ocean heat content data before the ARGO floats are of very limited value, and ocean heat content data based on ARGO floats are so riddled with problems they too are questionable. But even with all of the problems with, and adjustments to, the ocean heat content data, “What ocean heat content data reveal about global warming” (to modify the title of Stefan Rahmstorf’s post) is that the oceans warmed primarily via natural processes and forcings, not via manmade greenhouse gases. Due to the length of this post, I’ve created a pdf edition here. This entry was posted in CAGW Proponent Arguments, Ocean Heat Content Problems, Tamino. Bookmark the permalink. As usual, a cornucopia of useful analysis, excellent graphics, and a real contribution to understanding the intricacies of climate!!! Unfortunately, there is no way any politician (the one’s working the purse strings and deciding national policies) will ever read through your extensive rebuttal and explanations. I was recently at a community function (non-scientific) where a pollie stated that his speech is only repeating what he has been told so don’t blame him if he gets it wrong. As they are advised by organisations with alarmist-infiltrated management (such as the IPCC, CSIRO, etc), what hope that they will ever see or understand the alternative explanations? Thanks for continuing to ‘keep the b@st@rds honest, Bob. Excellent article Bob. I read Rahmstorf post about a week ago after being sent there by a non-scientist alarmist. I was quite bemused that he didn’t seem to know that the 1st law of thermodynamics only applies to closed systems. Bob, I’m amazed by the amount of work you put into your posts. Your explanation, as always, follows a flawless chain of logical, verifiable and understandable arguments. You must be putting an enormous amount into the preparation of graphics and animation. In this post, you certainly beat Rahmstorf. Kudos for your exceptional contribution to climate science and to the popularization of this complex scientific matter.